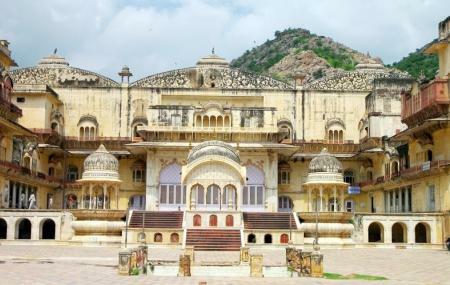 The City Palace or the Vinay Vilas Mahal in Alwar is the perfect example of a combination of Rajput and Mughal styles of architecture. This stunning monument was built by Maharaja Vinay Singh in 1793. It was the residence of the king. The model of a drinking cup cut out of a single, raw piece of emerald which is priceless. The beautiful lotus made of marble in the middle of the palace complex. The Vishnu temples on all sides. The exclusive mirror work on the walls and ceilings of the interior. 15 tall and 51 smaller towers overlooking the mountain slopes. The gates known as Jai Pol, Suraj Pol, Chand Pol, Krishen Pol, Laxman Pol and Andheri Gate. The Moosi Maharani Chhatri, named after the wife of Raja Bhaktawar Singh. This is where she is said to have died by jumping into her husband’s pyre. Inside this place there are two marble feet strewn with flower petals, representing the feet of the King and Queen. The Museum on the top floor that houses several miniature paintings of the Alwar School, miniature writings, manuscripts in Persian, Hindi, Urdu and other languages. The most famous is the Bostan (the garden of spring), Waqiat-E-Babri (autobiography of Babur) and Gulistan (garden of roses). It also has weapons, ancient statues, sandalwood, jade and ivory objects. It also has a lovely silver table to serve the nobles of that time. The most beautiful feature of this palace is the largest Durbar Hall. This has a small room which is a showcase of marvelous frescos. Another fantastic spot is the women’s chamber which is also beautifully carved. There is a two-storey carriage on the right of the entrance which can carry more than 50 people in it and is said to have been carried by four elephants. The water lakes that are artificially built inside, has an uncommon pea-green colored water in it. The company garden, known as Purjan Vihar which is a popular picnic spot. There is the golden throne on a raised platform in the Durbar hall. This palace is best described as the remaining of a golden era of beauty and grace of the ornate lifestyle of the Rajput Maharajas. The museum is closed on Friday. The roads reaching the palace are not in a good state. It is better not to take a tourist guide here as they are not very useful. Entry into the Durbar Hall needs a permit from the present Maharaja. INR 50 per person for foreigners. The museum closes half an hour early to the time specified. The nearest rail station is Alwar. How popular is City Palace? People normally club together Cenotaph Of Maharaja Bhaktawar Singh and Moosi Maharani Ki Chhatri while planning their visit to City Palace.